Officially announced last week along with the Motorola DROID XYBOARD tablets for Verizon, we were also introduced to a white cladded version of the beloved Motorola DROID RAZR – though, Big Red was silent about an official release date. 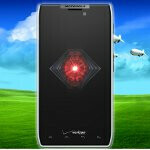 Well people, the good word is finally here, so get ready to pick up your white DROID RAZR. Already, we know that the pale Motorola DROID RAZR will be flaunting the same $299.99 on-contract price as its all black counterpart. Today, it’s officially known that the smartphone will become available for purchase starting tomorrow, December 15th – so get ready to have options available when you head into a Verizon store. Besides the new paint job, there’s nothing else particularly different with this venerable smartphone, as it packs all of the lovable qualities that we adore so much – like its fantastic build quality and stellar razor thin design. Interestingly, the device isn’t completely dressed in a white paint job, rather, its side and back area are painted in the new scheme, whereas its facade retains its piano black finish. Nevertheless, it’s still a beauty on its own! Damnit Verizon, I don't care about the RAZR. Where's the news about the Nexus! yes...I hash-tagged, get over it. Actually, a lot of people do care about the RAZR. I know you're eager for the nexus, but please don't post irrelevant posts. He didn't say no one cares about the RAZR, only he doesn't care about the RAZR...please make relevant replies. I went to my local Verizon store and they said the nexus will be launching along side the razr that's bird s**t colored....they also told me he would call me around 8 am tomorrow to let me know for sure. It seems Verizon is not going to be promoting the phone. Am I the only one who thinks it's weird that the only part that's white is the edges basically? The original image PA posted that showed an entirely white phone looked good. This... I don't know about. I would never buy a white phone anyways (don't ask me why, I don't really know) but I was planning on getting this for my girlfriend for Christmas. Now i'm not sure how I feel about it... guess i'll have to see it in person when I (hopefully) pick up my Nexus tomorrow. Hi my name is VZ and i have the android world by the BALLS. Want the best smartphone out? Sorry, im delaying it while blocking everyone else in the US from getting it. Why? Because i have the power too.